In the ’90s, Bill Clinton exploited fears about crime in the same way that Donald Trump uses immigration today. “I know those young people were just trying to get good television,” said Hillary Clinton’s husband as he reflected on his earlier decision to go horns-first after Black Lives Matter protesters. Imagine, for a moment, if George W. Bush had said those words after being confronted by angry Iraq War veterans. Instead, the ex-president is Bill Clinton, and the protesters were young African Americans whose parents, siblings, friends, and neighbors still endure the consequences of his 1994 Violent Crime Control and Enforcement Act. The 1994 crime bill is, like the Iraq war, an unwelcome guest showing up at feel-good candidate events. The 1994 crime bill is, like the Iraq war, an unwelcome guest continually showing up at feel-good candidate events. Twenty-two years ago, William Jefferson Clinton instigated the bill; Hillary Clinton lobbied for it; Bernie Sanders, then in the House, voted for it, reluctantly, after denouncing its core provisions. In recent months, both Clintons have stepped away from the crime bill’s legacy, allowing that, in the former president’s words, “too many laws were overly broad instead of appropriately tailored.” Candidate Hillary now declares that “the era of mass incarceration must end,” without quite saying who inaugurated it. But with 2.3 million Americans in behind bars and policing abuses a national scandal, the crime bill just keeps coming back. None of this—contrary to this year’s campaign mythology—was a fait accompli. Back in 1994, criminologists, civil-rights lawyers, community activists, and members of Congress all fought against various provisions of the bill. A hundred and sixty-nine members of the House, including Representative Ron Dellums, co-founder of the Congressional Black Caucus, voted against it. So did 34 senators. That it passed at all was a tribute to the Clinton administration’s cynical decision to bundle mandatory minimums and prison expansion with the Violence Against Women Act and weapons regulation, making it harder for uneasy progressives to just say no. And here’s the irony: By the time the crime bill was passed, violent crime was already on the way down. By 1995, the first year crime-bill funds found their way to states and cities, homicide was at the lowest level since the Reagan era, driven by changes in the drug market and other developments unrelated to Clinton’s tough-on-crime campaign. Neither the 1994 crime bill nor Hillary Clinton’s remarks about bringing teenage offenders “to heel” were a misstep. Not that it mattered, since the 1994 crime bill was never mostly about crime. It was designed from the beginning as a political symbol. Back in the 1990s, crime was to Bill Clinton as illegal immigration is to Donald Trump and Ted Cruz today: a way of reassuring fearful, alienated white voters, especially in the South. Fear of offenders, fear of gangs, fear of ungovernable teenage “superpredators” (a supposed generational wolf-pack who never actually appeared): Those were the political currency of the era. Like other New Democrats, Clinton had years earlier decided that the party’s best hope to win those voters back into the fold was to align themselves with a more conservative criminal-justice policy. This rallying cry resounded throughout the eight years of his presidency. Neither the 1994 bill nor Hillary Clinton’s ghastly remarks a year after the crime bill’s passage about bringing teenage offenders “to heel” were a one-off misstep. Fear of crime was the beating heart of Bill Clinton’s domestic policy. Why is all of this relevant now? First of all, memory should count for something. If it matters that Hillary Clinton voted for the Iraq War, it matters that she lobbied for a crime bill which many sensible progressives opposed. It is reasonable to ask whether a presidential candidate who still won’t reckon with her political choices 22 years ago is going to be hard-headed and frank about facing down unpopular decisions. The reopening of the emotional debate over this two-decade-old legislative package also shows just how much the country has been changed intellectually by Barack Obama’s presidency. The Clinton team of the 1990s hoped to rebuild a Democratic majority by seizing Republican terrain in the culture war, national security, economic deregulation, and crime. Now marriage equality is the law; voters turn a jaundiced eye on bloody foreign adventures; most of the public recognizes free trade deals as job-destruction programs. And as states go bankrupt paying for overcrowded prisons, even Republicans are sick of the war on drugs and videos of beat-down policing on YouTube. President Obama has chipped away with quiet determination at some of the Clinton crime bill’s most toxic legacies. The 1994 crime bill matters in this primary not merely as an object lesson in executive-branch opportunism but because the vastly unequal treatment of African Americans from one end of the criminal-justice system to the other remains an unanswered moral and political challenge. Whatever his faults, President Obama has for years chipped away with quiet determination at some of the Clinton crime bill’s most toxic legacies: The White House and Justice Department have been commuting sentences, reforming mandatory minimums, giving states unprecedented latitude in marijuana policy, even finding a legal loophole to re-establishing a small number of Pell tuition grants for prisoners as an experimental program without congressional approval. While Secretary Clinton is keen to be identified with President Obama’s legacy, her participation in the race-drenched crime policies of the 1990s presents her with a dilemma—and she has yet to fully choose which legacy to embrace. Her criminal-justice policies posted thus far to her website are progressive, but for the most part sound generic, timid, and lacking in specifics or vision. Most people agree on body cams for police; she’s for that. Extending President Obama’s legacy of commutation and prisoner-education grants are far more contentious topics—and there’s no mention of these crucial, conscience-driven initiatives in her criminal-justice platform. Opportunistic, expensive, racially biased, the crime bill of 1994 won’t go away by itself. That is why it belongs on this year’s political agenda. 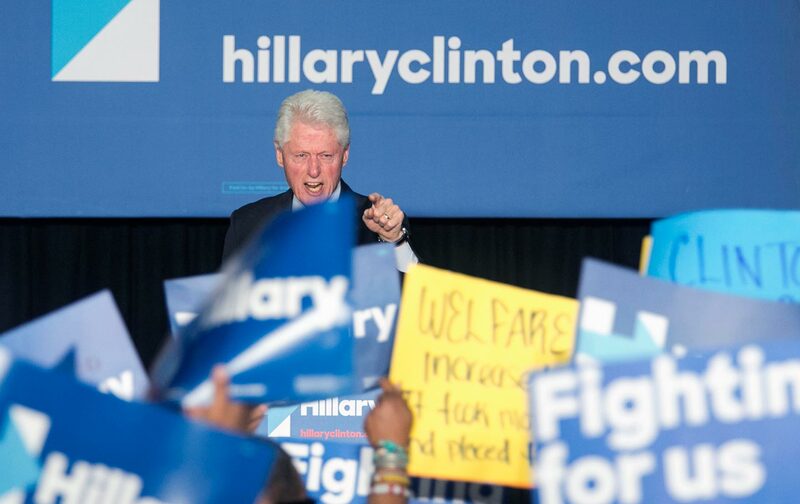 The Black Lives Matter protesters who confronted Bill Clinton this week weren’t trying to get good television. They were trying to get good leadership.